Real estate investment trust (REIT) expert and author Kenneth Campbell details life inside REIT Revolution, shares lessons for future financiers in new book. If you find something you’re good at, know a lot about and have people who are willing to listen to you, it’s worth the risk. Rising from a gritty Pennsylvania steel town, Kenneth Campbell worked his way up the ladder to arrive at the position he now holds as one of the country’s foremost experts on REITS, or real estate investment trusts. 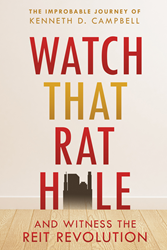 “Watch That Rat Hole” details Campbell’s rise to expertise in the industry and exposes the in’s and out’s of the industry and its volatile twists and turns into the modern-day equity REIT industry that investors now know. Campbell spent over 20 years publishing a bi-monthly advisory newsletter covering the niche topic of REITs, advised investors based on market growth and decline, published the first hardcover book on REITs and ultimately became a leading voice among REIT investors. For more information, visit watchthatrathole.com. Kenneth D. Campbell created and edited an influential investment newsletter for twenty years, co-wrote “The Real Estate Trusts: America’s Newest Billionaires,” the first full-length book on REITs and co-founded a global firm managing $20 billion in assets. Now eighty-six, Campbell lives with Irene, his wife of sixty-four years, outside Philadelphia.